Dewalt's 20V MAX 5.0 Ah XR Premium Lithium-Ion Batteries will provide up to 60% more capacity than a standard 20V MAX battery pack. The 3-LED Fuel Gauge System allows gives you instant feedback on the charging state. And these XR Premium batteries have no memory and virtually no self-discharge for maximum productivity and minimal downtime. Great power, great weight, great price. Thinking of buying a second set just to have one more! Excellent way to begin to purchase electric power tools. It allows one to pick out the tools that will go into a set you purchase with out getting something you do not use. These batteries are beasts! Great life and quick recharge. Fairly light for the size also. good price and quick delivery have used the 20v system for several years and they have far more longevity than the 18v system . Bought this as a Father's Day gift for my son. He uses DeWalt tools in this job. Obviously, bought it as it was such a good deal with the free items. i only use dewalt because of the quality,and toughness. when cpo had their buy a starter kit get 2 free tools it was nobrainer. Not only do you get 5a xr batteries but 2 free bare tools. no combo kit offer has 5a batts and a choice of tools. custom combos are usually alot more expensive and hardly have the exact tools you need. i would recomend this deal to any pro or handyman work around the house this is the best deal you will find. As a general contractor, I am almost entirely cordless and need batteries to get the job done. These 5 AH batteries easily last most of a week in my impact, oscillating tool, and flashlights. Flexvolt batteries power my 20v circular saw and miter saw and last several days as well. If you are a pro or a DIYer, ditch the small batteries. Your tools will run better, last longer, and you will never have to wait for a battery to charge. I work in the construction/carpentering field every day and stoped using dewalt several years ago because there 18v stuff was junk and just wouldn't last. Been using Milwaukee 18v for past 10 yrs or so. Thought I would give dewalt another try and bought these batteries and an impact and I can't be happier. These batteries are awesome and last forever! Very satisfied! This was a great value and great addition to my Dewalt tools. Great deal for 2 batteries and 2 free tools .Used the heck out of them right out of the boxes.Longer battery life and seems that they have more power.Received the grinder and jig saw as the free tools awesome and very convenient. No power cords just grab and work . Going to order 2 more batteries and 2 more free tools the grease gun and a sawzall. Thanks by the way delivery was extremely fast. Just what I needed. Longer battery life. Just the best tools for my work. I have several 20volt tools . I absolutely love it. I build pole barns and sometimes I have no electricity so I build pole barns with my cordless DeWalt tools. I just recently built a 30x50x16 with all cordless tools. You can definitely tell a difference in runtime between these 5 amp hour batteries and my 4 and 3 ah batteries. I would never spend this much, but it came with two tools and the batteries so it was worth it. With a brushless drill or driver you can use the 2 ah batteries and have them last a full day of moderate use, but a power hog like the grinder is where the 5 amp is especially useful. I was able to grind for much longer than usual, grinding old caulking off of brick, and cutting brick and mortar when I was replacing windows. It's nice though to just have more batteries. I have (2) 2ah batteries for my driver and drill, (1) 3ah battery for my radio (which will last all day), (3) 4 ah batteries for my circular saw, reciprocating saw and nail gun, and now (2) 5 ah batteries for the grinder. With that setup I could go all day on the jobsite doing whatever I need to, though several batteries would have bit the dust by the end of the day. I think if I had 2 more 5 ah batteries, I could go all day and not have to keep switching batteries from one tool to another by the end of the day. I purchased this set as a black Friday type deal and paid 275 bought it because I could pick two bare tools. So I got the jig saw and grinder which if bought as separate items would have been about 270 alone. So for 5 bucks I got two HD battery's and a charger if you look at it that way. 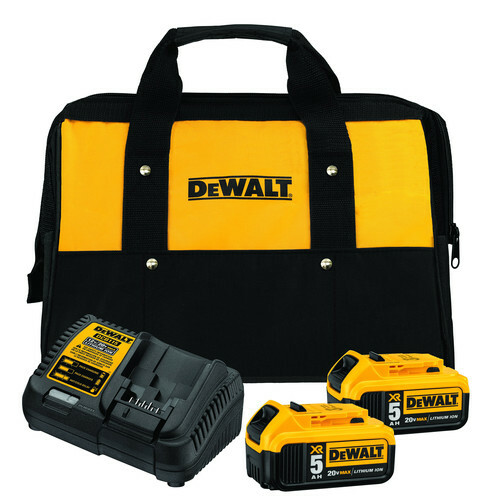 I am carpenter by trade and use dewalt tools every day and they hold up very well. This set will complement the other 20 volt drill, impact driver, sawzall, and circular saw I all ready own.